So, in late March of this year I decided to delete my Facebook account – primarily due to the Cambridge Analytica scandal coming to light. Since then, additional revelations have lowered even further my opinion of Facebook’s corporate governance and overall morality; I believe the company should be much more heavily regulated, if not entirely shut down by the FTC or the like. Anyhow, back to March – I went to download a copy of my information on Facebook in preparation for deleting my account, and eventually received a zip file with my facebook profile, messages, and photos… that I had uploaded myself, but not all of the other photos in my profile that were uploaded by other people (and appeared in my “Photos of You” tab). It seemed there was no way to get those photos downloaded except for going to them one by one, which I started to do, and then gave up after a short while, and decided merely to “Deactivate” my account until I had time to come back and download all these photos, or find a better way to get them. So here I am, in the Xmas-New Year’s break, and Googling for a solution. Lo and behold, a fellow named Nathan Merritt has figured out a way, described in this excellent post. There’s some additional discussion on the comments about how to enhance his solution for downloading full-size photos, which caseklim solves well. At the end of the day, if you aren’t tagged in that many photos that you didn’t upload yourself, it may not be worth this extra time / work – but for most people, this method will probably end up being faster (and much less tedious) than downloading all those photos one by one. Next on the to do list: Nathan’s post also made me take another look at diaspora*, which I thought had died years ago, but appears to still have an active developer community and one would assume by this point a decent-sized user base… ? Other alternatives mentioned are Ello (which I think I tried when it was new, and didn’t catch on) and Vero. In this photo I’ve already removed the retaining ring from the 24-tooth middle gear (which I’ll call gear #2) in preparation for sliding it off the shaft. 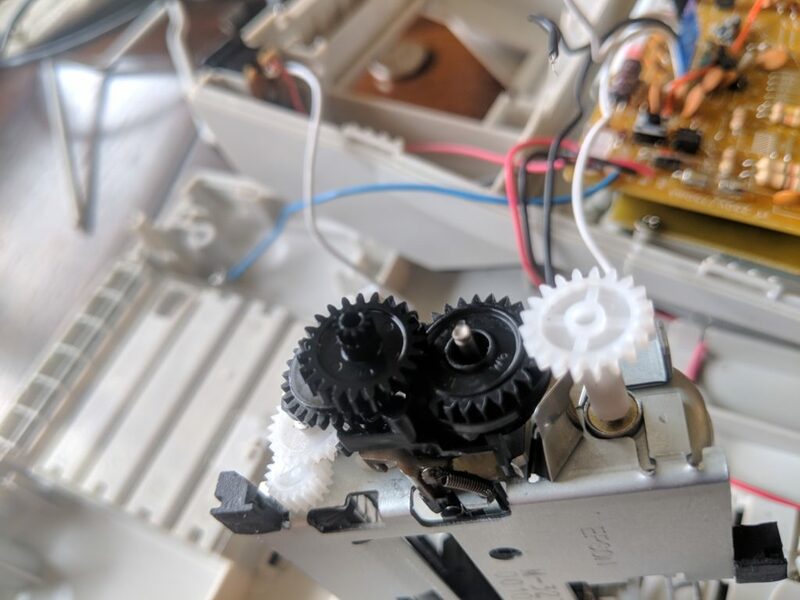 The white gear on the right (I’ll call gear #1) is directly driven from the motor shaft, which only spins in one direction (counter-clockwise, from the perspective of this photo). Thus, gear #2 spins clockwise. In the next photo (above), I’ve pulled off gear #2 and flipped it over, so you can see the smaller 12-tooth concentric gear on its back face, which (when assembled) fits inside the hub of what I’ll call gear #3, the black gear behind it on the same shaft. 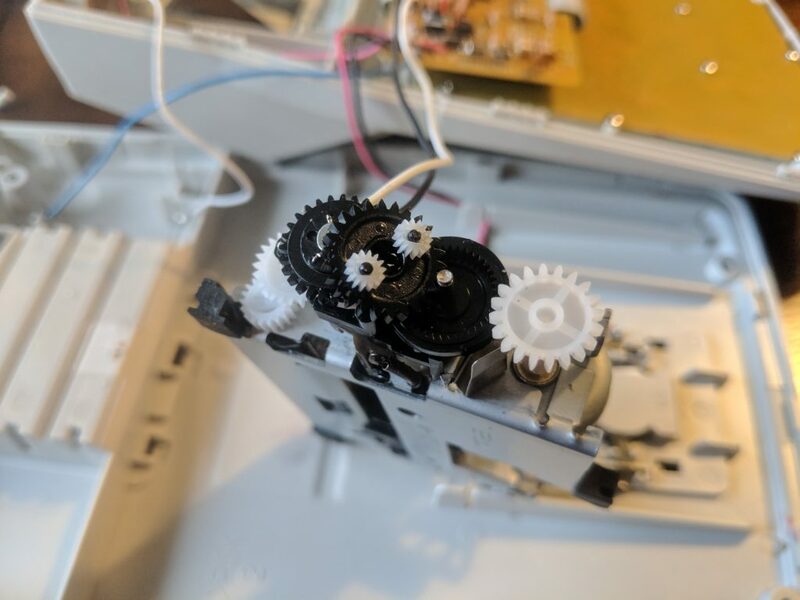 The hub has interfacing teeth inside it (not visible in this photo), so as a result this gear rotates more slowly than gear #2. In the next photo (above), I’ve flipped gear #3 over, exposing two planet gears on its back side, and an internal ring gear (gear #4) that these planet gears interface to, that sits on the same shaft behind gear #3. 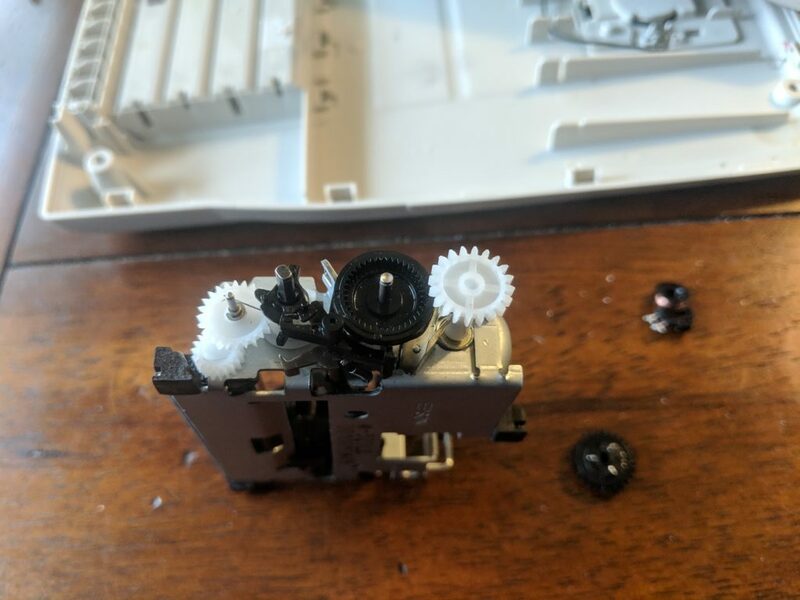 The next photo (above) shows a different view, with gears 2 and 3 still assembled, but with the black gear (gear #5) from the next axle over removed, exposing an electromagnetic coil connected to the other pair of black & white wires. 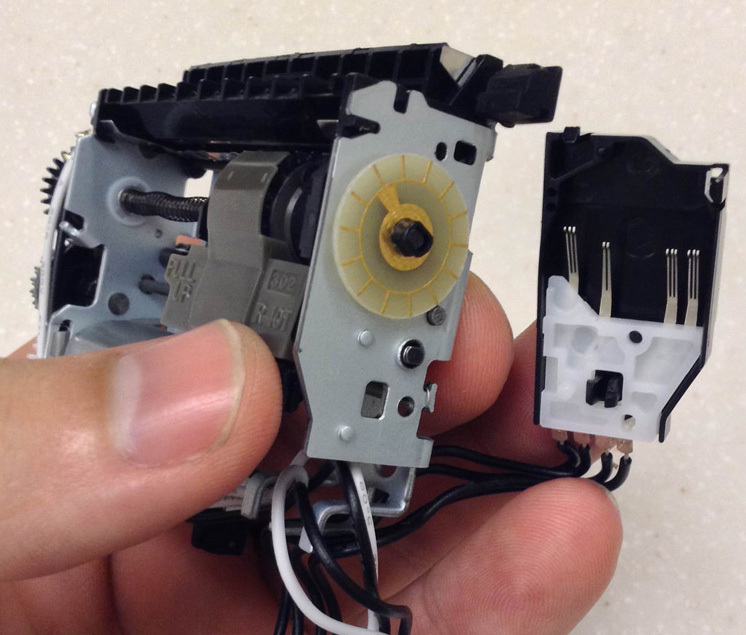 This is what Reece and Arne call the solenoid, although it doesn’t seem to have a core that is actuated linearly. In the next photo above, the coil assembly has been removed, exposing another assembly consisting of a black plastic cam, a compression spring, and a equilateral Y-shaped metal piece – probably ferrous, as I think this is what the electromagnetic force actuates when the coil is energized. Behind the black plastic cam you can see a torsion spring, one end of which is resting on the nearest axle (which I’ll call axle #4; axle #1 has gear #1, axle #2 has gear #’s 2, 3, and 4, and axle #3 has gear #5). 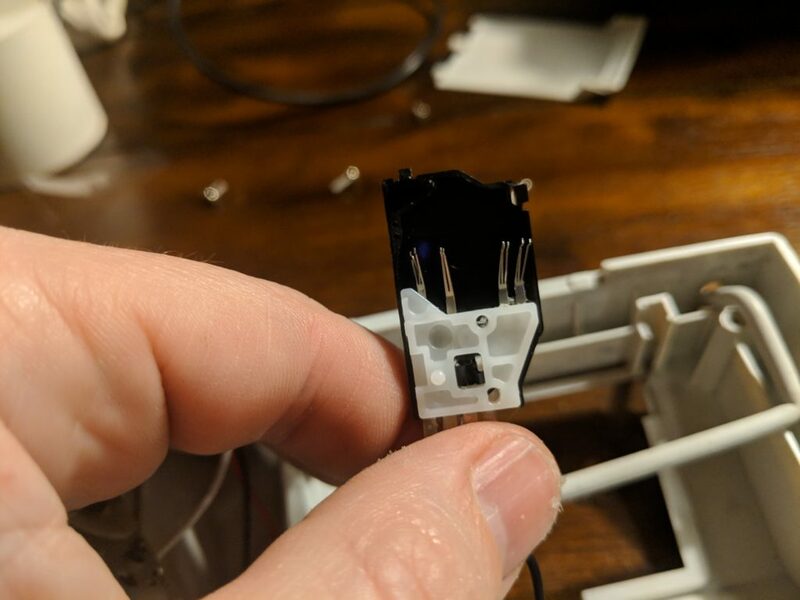 You can see three holes in the metal Y, one on each leg, which interface to small pegs on each of three corresponding legs of the black plastic cam. Thus, when the metal Y rotates, so does the cam. When the force on the metal Y is removed, the torsion spring returns both the cam and the metal Y to their resting position. The photo above shows the black plastic cam on axle #3, with the metal Y and compression spring removed. There are actually two levers that the cam affects, one black and one brown. A regular occurrence when I visit my parents’ house is being given one or more things to fix. It could be anything from an electronic key fob for a car to a broken dishwasher handle. 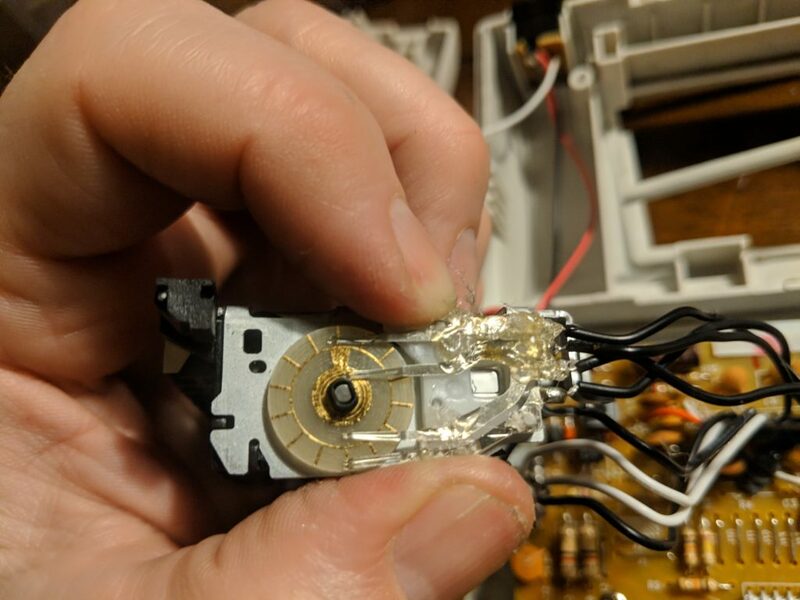 Oftentimes the fix is relatively quick, as they don’t usually get too far before giving up – so it may be just a matter of opening up a housing, changing a battery or bending a spring connector or cleaning out some dirt or grease, and putting it back together. At Christmas this year, my Dad handed me his Sharp EL-1750V printing calculator and told me that ever since he had dropped it, it was no longer loading paper. I was rather surprised that anyone still used a printing calculator, while he was surprised that anyone could do their taxes without one. He of course had a backup printing calculator, but didn’t like it as much as his trusty Sharp, so asked if I could fix it. 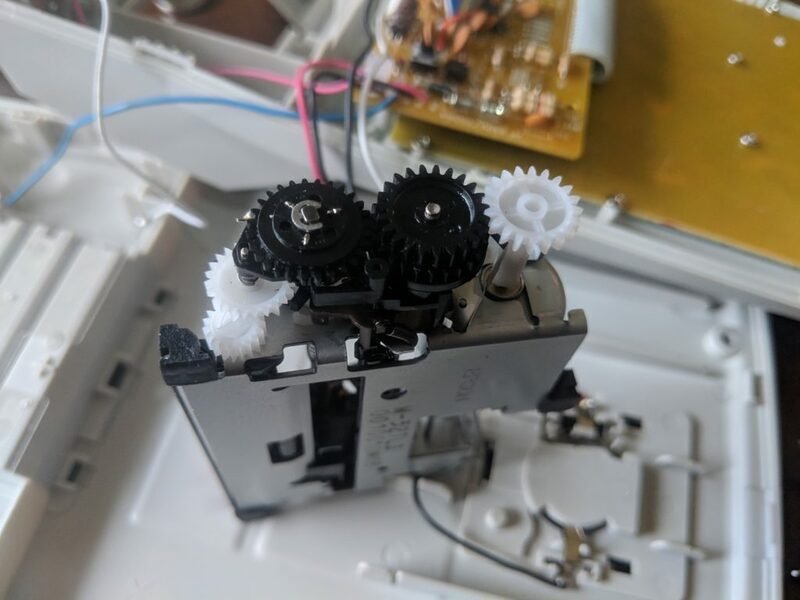 I rolled my eyes a bit, but after looking at it a little more closely, saw a low-cost DC motor that reminded me of my days in the electronic toy industry, and an intriguing array of axles and gears that made me think I might learn something just from the teardown. The best thing about trying to fix something like this (that is otherwise too cheap to waste time trying to fix) is that there’s nothing to lose. So, after opening it up, the core is a module made by Epson, the M-32TL. 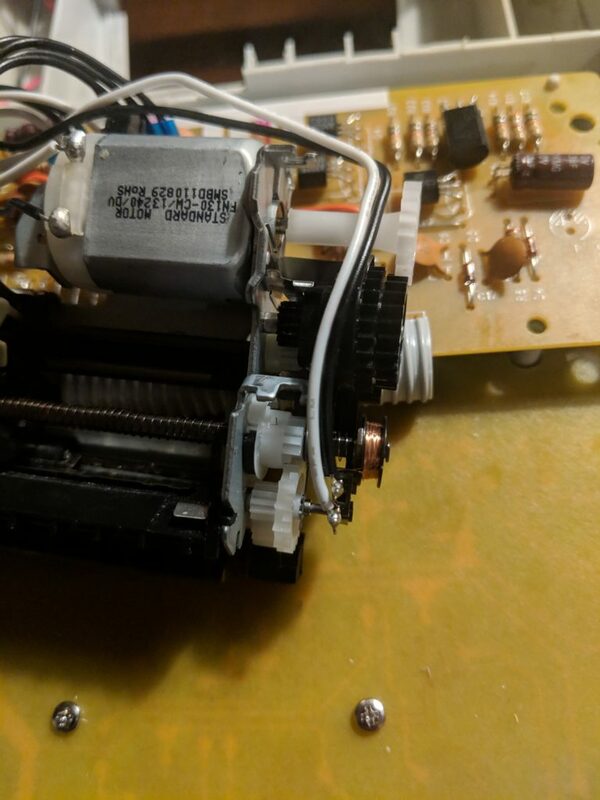 The best reference I found from Googling that was a series of blog posts by an engineer named Reece Pollack, who cannibalized the same module from a Canon P170-DH and, with some help from Arne Rossius’ page on the similar (but single color) Epson M-31A module, reverse engineered it sufficiently to build his own driver with a PIC microcontroller on a breadboard. 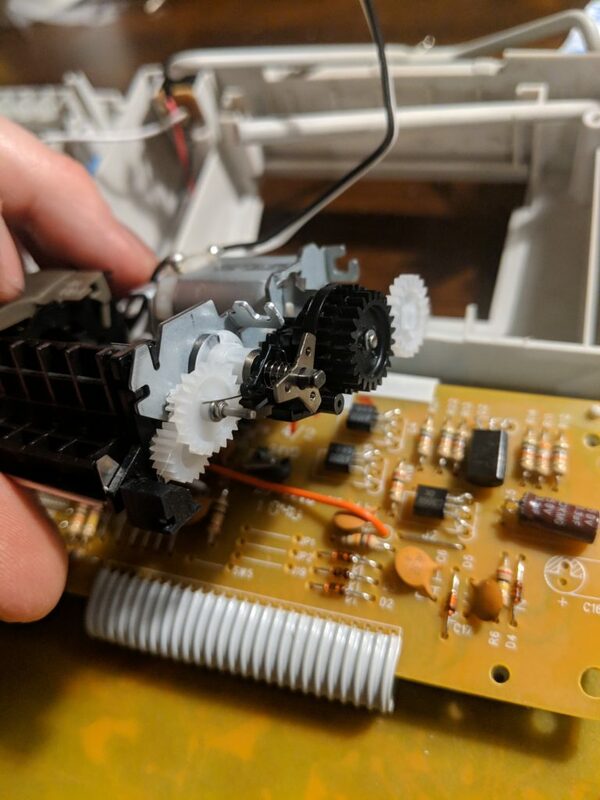 The M-32TL appears to also be in the Canon P23-DH (based on this teardown), and I would guess most other 2-color printing calculators made today (also that work with the IR-40T ink roller or compatible variants). While the brushes are somewhat bent, it will probably work okay, but instead of stopping there and putting everything back together, I decided I really wanted to understand the mechanism, including how the single solenoid is used to both press one character (of three) against the paper for printing, and advance the print head to another column. More on that to come.